Outlet tubs | Bartok design Co. 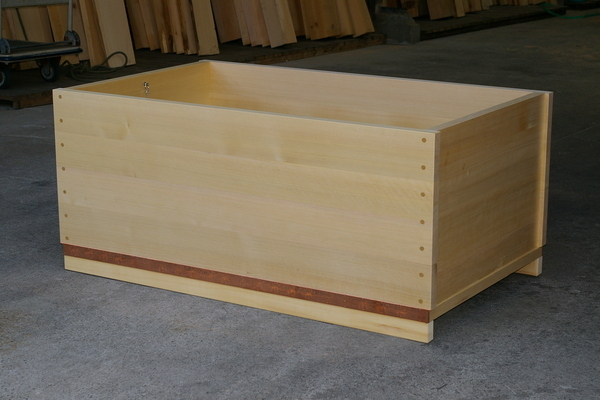 Outlet tubs – Page 2 – Bartok design Co.
We decided to replicate a wooden tub that was the standard in every japanese household before the WWII. It is compact and reasonably priced. 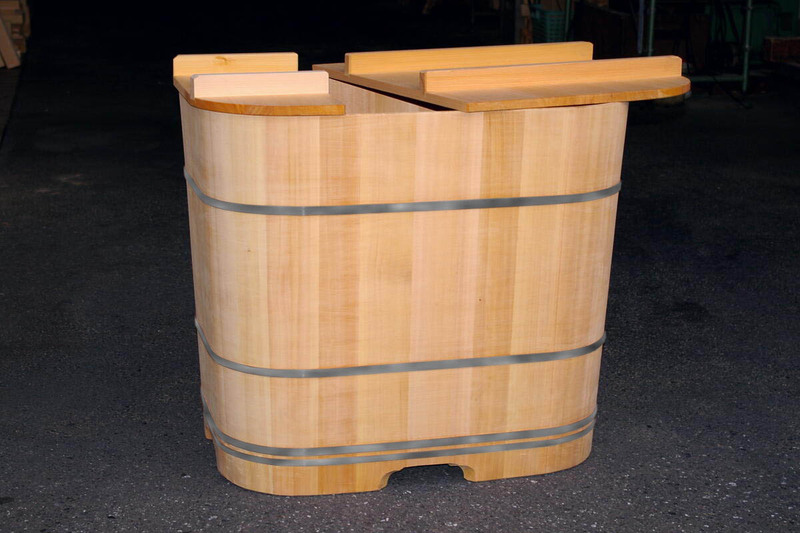 High quality japanese handicraft, solid and durable. We use 100% japanese sawara wood. The straps are in stainless steel. 5) Shipping: please let us know your exact address for the estimate. If you are making arrangements yourself for the shipping, you can purchase it in one-click! – Otherwise contact us by email for other payment/shipping options. 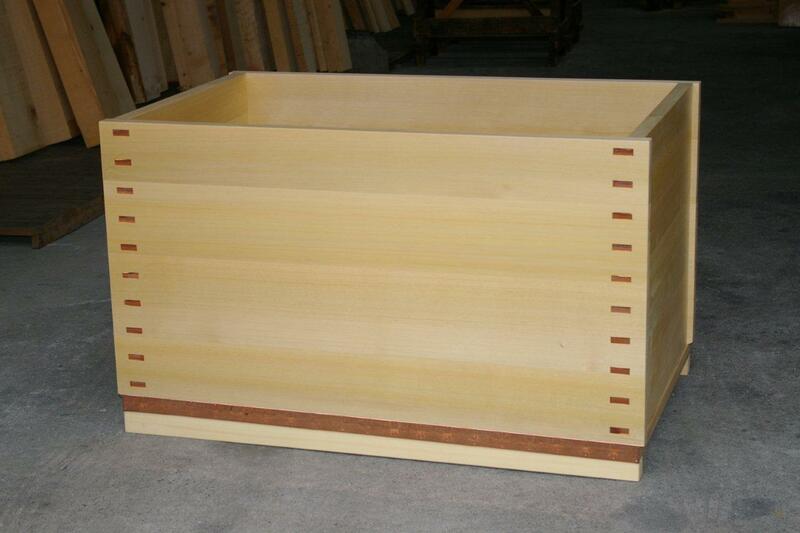 A client from the UK purchased from us this beautiful type tub. Unfortunately, there was a mistake in coordinating the sizes and the tub could not be installed. The cost of the tub inclusive of shipping charge to London was 9,000 GBP. The owner is willing to sell it for 6,000 GBP to any japanese bathtub lover based in the UK or Europe. 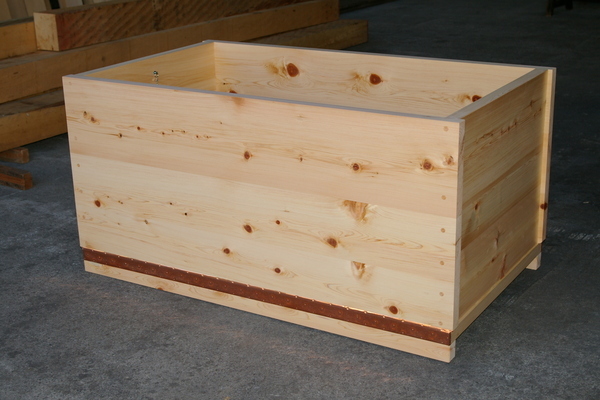 The depth matches a wester style tub and is safe to be used by children. Meterial in Kiso Hinoki AB grade. Conditions are: brand new, never used or installed. If you are interested please contact us at: japan@bartokdesign.com so we can put you in communication with the seller. A grumpy elder lumberyard of our network, finally decided to part from a vintage lot of asnaro wood he is guarding for some 30 years. The wood is perfectly dry so there is no worry of cracking. 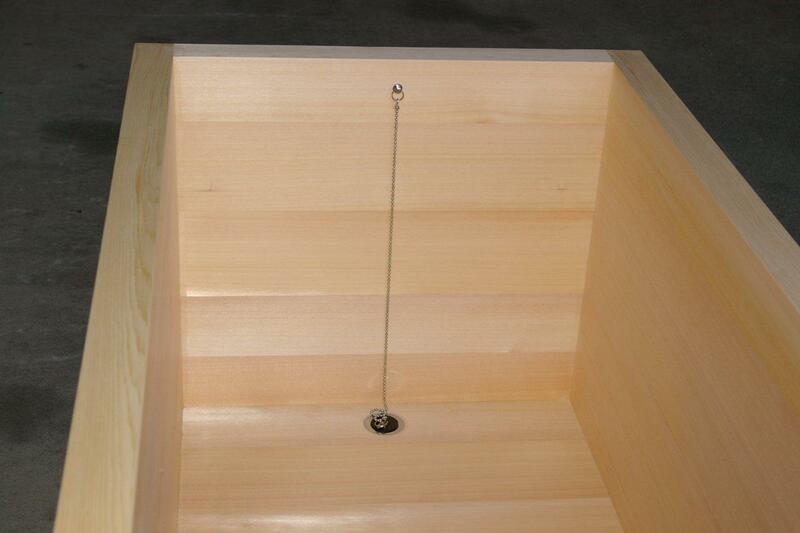 To use fully the planks width we built a tub some 90mm deeper than the average. Click here: (outlet130620.pdf) to download it in acrobat format. The wood itself is vintage, dry and aromatic. knots and this allowed us to use the full planks width. If you are looking for the best cost-performance, this is a chance you cannot miss! 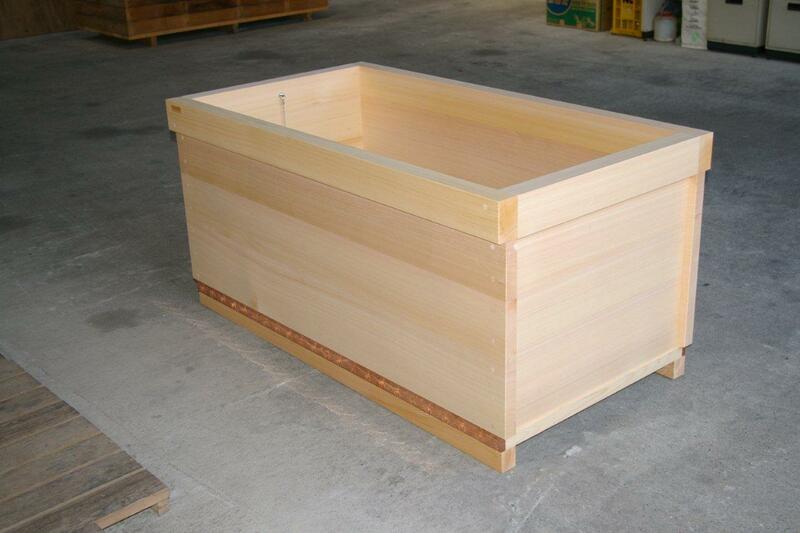 quality: kiso valley hinoki wood. 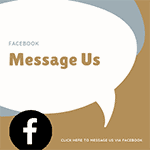 Click here: (outlet120810.pdf) to download it in acrobat format. Are you into energy saving, recycling, waste reduction? Would you choose an organic vegetable soup over an overstuffed hamburger? Do you enjoy a hike on the Rokies more than window shopping on 5th Avenue? Than, this tub is for you! The front planks have a nice gradation and are joined in such a way to enhance this quality, like a rainbow. All the material is beautiful asnaro wood and comes from the same lot, which was partially used for another project. But how could we make it so cheap? We could considerably reduce the cost by using some AB grade material. Note from the pictures below that there are 2 flush knots in the top frame border we used. Of course this does not affect the quality of the wood, actually the eco-scrooge who lives inside you will enjoy the skillful inlays as the mole on Marilyn`s beautiful cheek! I cannot really explain in writing how silky is this tub`s inside. If you have a chance to visit Japan, consider dropping by at our warehouse in Yotsukaido (near Narita airport). This tub is worth a trip! Click here: (ofuro drawing) to download it in acrobat format. We had a beautiful lot of natural dry knotty hinoki: optimizing the material available, we could build a well proportioned, with some extra depth for a relaxing bath with warm water up to the chin! Of course also this is spotless and brand new. We can offer at a discount price because we used material we had in stock without loss. 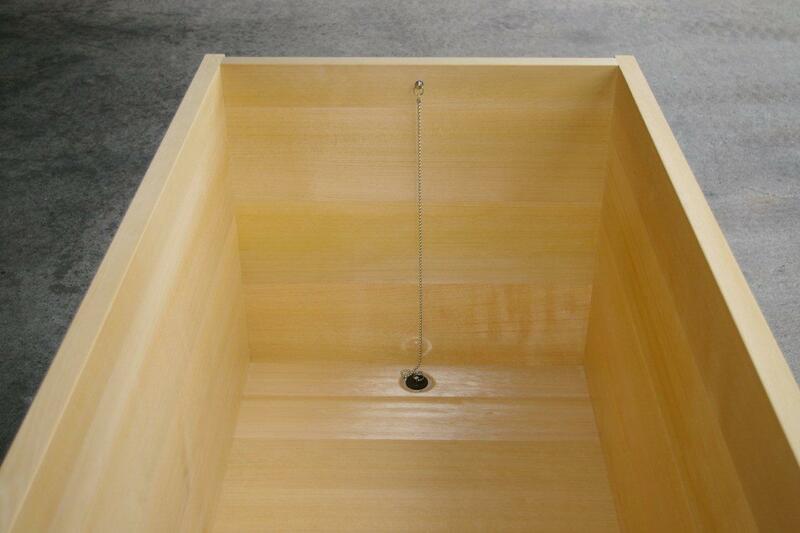 quality: knotty natural Hinoki bathtub. 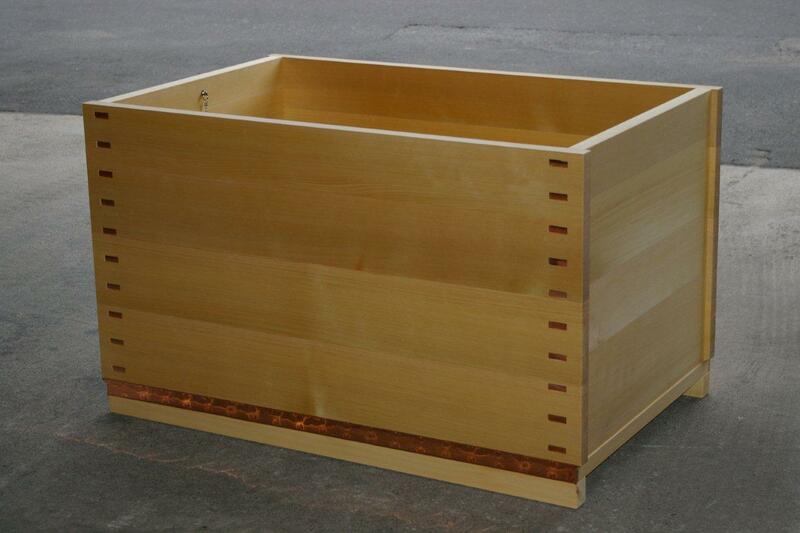 The tub has a minimalist design, is equipped with a copper apron and the joints are finished with wooden dowels. 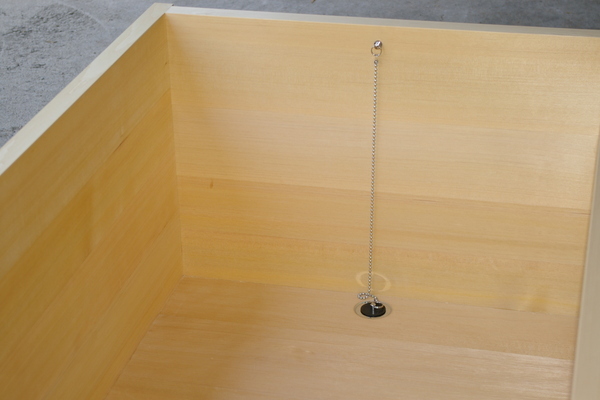 Following the positive response we received for of our last outlet tub “Warm shoulders”, we decided to build a similar tub, just a little longer and wider. This tub is slightly shallower than the previous one, anyway given it is longer and you can extend your legs it is perfect for enjoying a deep soak bath. To warm up the body till the core of the bones, nothing can beat a relaxing bath in hot water. then you should try a japanese deep soaking tub. 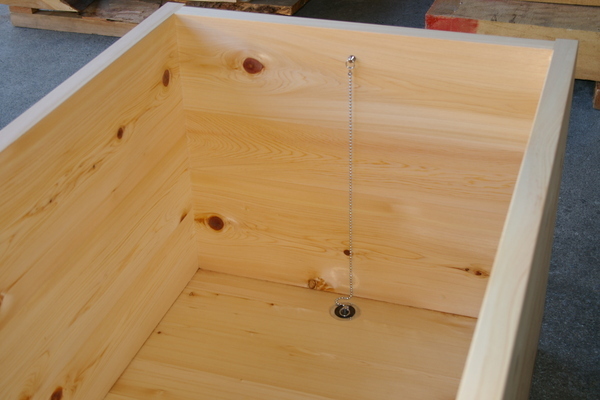 Here we are presenting a lovely outlet tub. Of course it is spotless and brand new. We can offer at a discount price because we used material we had in stock without loss. 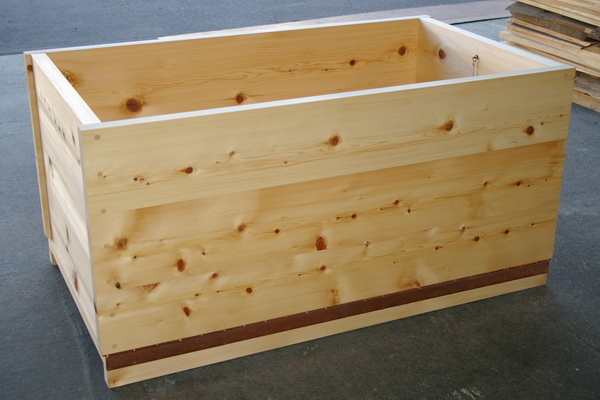 The result is a tub compact in size but deeper than the average. 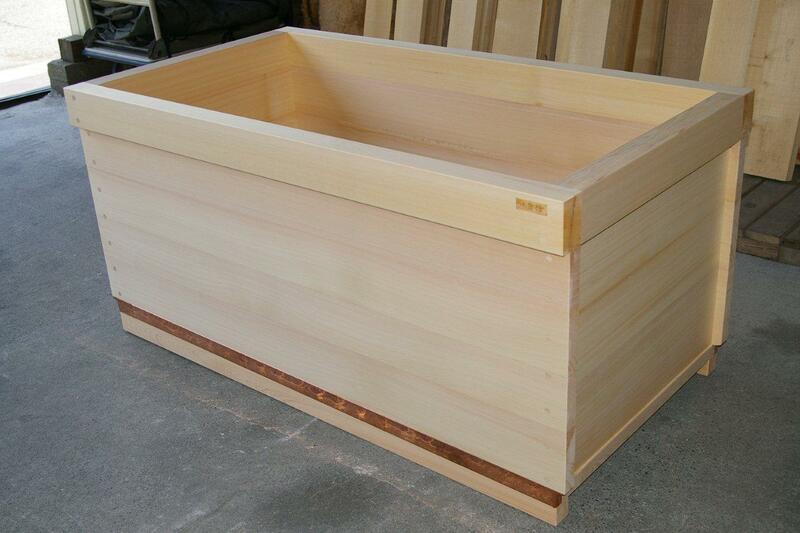 Consider that if normally the internal depth for a japanese tub is 550mm, this is 640mm. or you can take advantage of the extra depth as an extra safety, by using it with normal amount of water in situations where you cannot overflow on the floor. 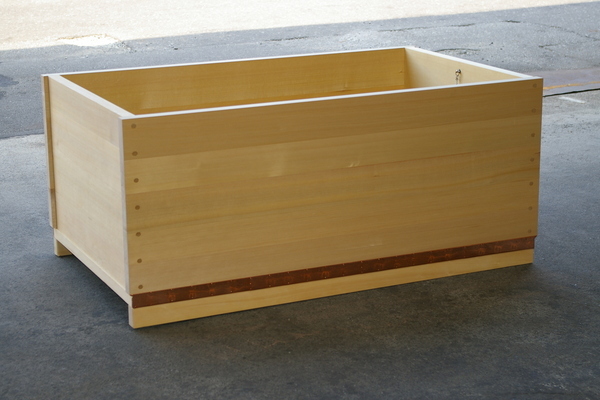 The tub has a minimalist design, is equipped with a copper apron and the joints are finished with Edo-style copper plates.